Organize all your contact details and interactions in one centralized, integrated database, create segmented lists, and score leads so sales can prioritize their outreach. Start using HubSpot's lead management tools to organize and prioritize your leads. See why thousands of customers use HubSpot to manage their leads in a central, integrated database. Get the full picture for every lead in a single, integrated database. See every detail about a lead in one timeline. Stop wasting time combining data from disconnected tools and databases. 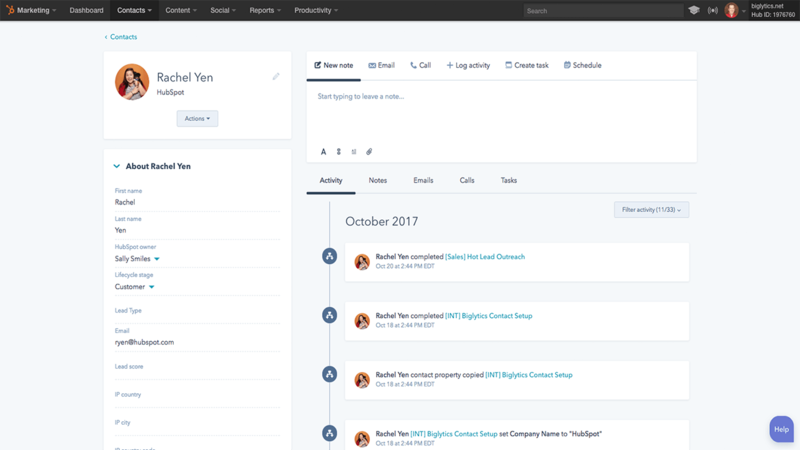 Best of all, HubSpot’s contacts database integrates with HubSpot CRM, Salesforce, and virtually any other CRM system so your sales team can get the full context of a lead’s history and make informed follow-ups. Segment and nurture leads, and grow your database. All-in-one contact intelligence makes it easy to build targeted lists, automate your email campaigns, and expand your database. Import existing contact details, build forms to convert visitors into leads and grow your database, and create unlimited custom fields to collect critical lead details. Then segment contact lists based on any data you’ve collected – properties, website visits, email interactions, and more. Use these hyper-targeted segments to send emails, personalize website content, and power marketing automation campaigns so you can effectively nurture your leads further down the funnel. Automatically score and prioritize leads for sales. Make it easy for sales to identify the most qualified leads by assigning lead scores automatically. Use your lead scores to prioritize follow-up for your sales team or set up workflows to notify reps when their prospects reach a certain lead score threshold.